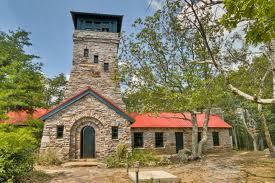 Cheaha State Park, operated by Alabama State Parks, is a 2719 mountain-top wilderness preserve. Facilities include a 30-unit resort inn, restaurant, vacation cottages, chalets, modern campground, picnic areas, biking trails, hiking trails and lots of beautiful scenery. Centrally located in the Talladega National Forest, Cheaha Resort State Park is ideal for access to the Kentuck ORV trail, an ATV trail built and maintained by the National Forest Service. The Park is home to the Cheaha Trailhead of the Pinhoti National Recreation Trail. The park hosts hiking trails, mountain bike trails, a lake for swimming and fishing, an observation tower at the highest point, campgrounds, cabins, chalets, motel rooms, a restaurant, an indian artifact museum, and much more. The park is also completely surrounded by the Talladega National Forest which offers additional recreational resources, like easily accessible trails to waterfalls and more. This park, which is Alabama's oldest continuously operating state park, encompasses Cheaha Mountain, the highest point in the state. The highest point is marked with a USGS benchmark in front of Bunker Tower, a stone Civilian Conservation Corps building with an observation deck on top. The old road is known as CC Road and contains interesting ruins. Near the peak is Bald Rock, which was recently improved with a wheelchair-accessible wooden walkway that provides an impressive overlook of the surrounding region. Cheaha Mountain is part of the Talladega Mountains, a final southern segment of the Blue Ridge. The collection contains hundreds of pieces including arrowheads, stone tools and musical instruments. The Indian relic museum is available for tours by park guests, home school groups, school field trips and other special tours. Museum hour’s tours must be booked ahead of time for weekdays. The entrance fee is $2 per person, with no charge for children age 6 and under. Open Sat-Sun, 10AM-4PM. (Late Sept) This is a great single and double track off-road experience. The race will start on a street, but will soon lead into the woods. The terrain is made up of a little bit of everything, rolling hills, climbs, single track, double tracks, roots, along with some technical sessions. The course is beautiful and offers something for every runner truly wanting to “ditch the city”. Dirty Spokes for complete information regarding registration. locations and run specifics. Usually held last weekend in Sept.
(Sep/Oct) The difference you will find as you travel here from other places will be the color change from bottom to top. Drive From Talladega Hwy 21 you will get places with a canopy and drive thru the Talladega National forest. This area is still in color it was the first to color and we feel it will be the best. The drive to and from our lake is breath taking! Drive from Hwy 49 this is a short distance giving you the least amount of color change. Drive from I-20, 431 and Hwy 281 you will get the top views these change slower however there are pull overs that are breath taking. Pinhoti National Recreation Trail is a long-distance trail, 335 miles long, located in the United States within the states Alabama and Georgia. The Park is home to the Cheaha Trailhead of the Pinhoti Trail, a 107-mile trail eventually connecting into the National Parks Service, Appalachian Trail, accessing trails like the Odum Scout Trail or the Chinnabee Silent Trail where there are some of the most beautiful waterfalls in the area. Camp Mac is a summer camp for boys and girls in Alabama's Cheaha Mountains, surrounded by the Talladega National Forest. Camp Mac offers a Jr. 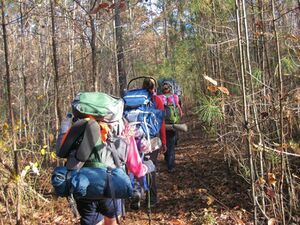 Term, which is 2 weeks long and is a starter camp for children who have completed the 2nd through 5th grade. They also offer two premium 4 Week Terms that offer more advanced activities for children who have completed the 2nd through 9th grades. Camp Mac is labeled as a "Learning Camp" and offers activities based on the philosophy of Safety, Fun & Instruction. Kentuck ORV Trail - Centrally located in the Talladega National Forest, Cheaha Resort State Park is ideal for access to the Kentuck ORV trail, an ATV trail built and maintained by the National Forest Service. This page was last edited on 13 January 2018, at 20:37.